This might sound clich&eacute;, but the real winner of this series is us, the fans! The fiercely-contested PBA Commissioner’s Cup Finals is finally over with the Talk 'N Text Tropang Texters outlasting the Rain Or Shine Elasto Painters in a highly physical series. Only the Mayweather-Pacquiao fight this Sunday could be more (legally) physical than this clash. Through seven games, both teams made incredible runs to make it a back-and-forth series, culminating in a historic double-overtime Game 7 classic that's defo one for the books. In the end, only two points separated the team (121-119), but that was enough for Jong Uichico and co. to bring home the proverbial bacon. It's all over now, but we're going to talk about this series for a long time. Both teams deserve praise, especially since they gave us he kind of highlights we expect from a championship series. And from these great plays we painstakingly picked the 10 most memorable moments of the 2015 PBA Commissioner's Cup Finals. Check 'em out below! Talk 'N Text import Ivan Johnson didn’t exactly start off on the right foot with Rain Or Shine in the Finals. In the third quarter of Game 1, Gabe Norwood fouled Jayson Castro after a botched fastbreak by ROS. During the stoppage of play, Johnson chose to jog at the tightest spot on the basketball court: right between Norwood and Coach Yeng Guiao. The result? Johnson hit Guiao, who fell on the bench, earning the ire of the Elasto Painters' coaching staff, and later, the Commissioner’s Office, who slapped a hefty P150,000 fine on the American reinforcement. Whoever said Castro can’t shoot is still living in 2010. In Game 2, the TnT PG exploded for 44 points, including nine three pointers–breaking the PBA Finals record (eight by some dude named Robert Jaworski). They led by as much as 17 points in the game, but Rain Or Shine fought back in the second half to even out the series, 1-1. That won't diminish the fact that, yes, Jayson is one of the best players today of this era. With the series tied at one apiece, a Game 3 win was crucial for both teams. Needless to say, ROS and TnT played their hearts out. Unfortunately, Johnson helped Paul Lee play with his tooth out as well. 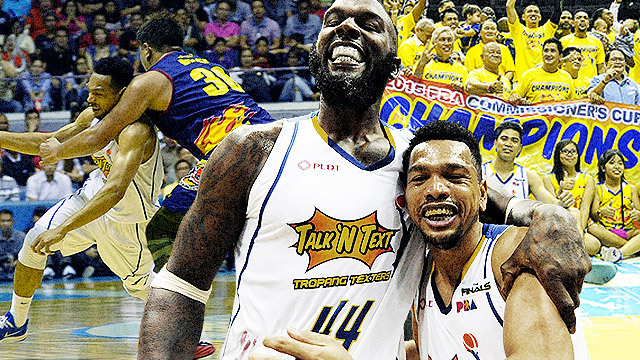 Just before Game 4, Rain Or Shine import Wayne Chism was adjudged the Best Import of the Conference. Through the first three games of the series, he proved that he was every bit deserving of the accolade, scoring at least 30 points for the Elasto Painters during that span. After getting the award, though, he played his worst game of the series, scoring only 13 points on 2-of-10 shooting from the field. Jinx? Nah. TnT's unforgiving D and foul trouble were the culprit, not anything superstitious! The physical nature of this series can be aptly summed up by the melee that ensued in Game 4. Talk 'N Text rookie Ganuelas-Rosser and Rain Or Shine’s designated defender Jireh Ibañez were battling for a rebounding position at the post, and later got so entangled that MGR had to let go of his jersey just to get out of Ibañez's MMA-like hold. Oh, and he threw down Ibañez to the crowd in the process. One half of ROS’s Extra Rice Inc., JR "Baby Shaq" Quiñahan, saw the skirmish and didn't like how his teammate went down. He went full Dragon Ball on Rosser and hit him in the face with the ball in a move that reminded us of Frieza's planet-destroyer. It resulted in an ejection for the men involved, and an added one-game suspension for Frieza Quiñahan. While the Tropang Texters operated on a short nine-man rotation for most of the series, the Elasto Painters relied on their bench more. Lee and Chism will get their points, but with Coach Yeng, you’ll never know who the third guy will be. In Game 2 it was Jeff Chan’s 17 points on 5-6 shooting. In Game 3, it was Jericho Cruz’s 14 points off the bench. In Game 4, it was Chris Tiu’s career-high 21 points. In Game 6, it was Raymond Almazan's 18 points and 10 rebounds that helped them escape elimination. Nobody can hugot like the master can. The series has been exciting on and off the court, with Coach Yeng having much to say about TnT's Johnson. Apart from the shove in Game 1, the fiery ROS tactician cited several other infractions (e.g. the aforementioned teeth-shattering elbow-to-Paul-Lee's-face move) by Talk 'N Text's hulking import which he felt deserved more sanctions. The fiery coach even went as far as saying that Johnson was "mentally unstable" because of his actions. Whoa! Miller was featured in a "Chill Time" ad segment during the series, practicing his shooting form on the bench. It was the only airtime he got apart from some random shots of the TnT bench. That is, until Game 7. Coach Jong tried to do the hugot thing Coach Yeng is known for and pulled Miller from deep in the bench to play at the end of the second and third quarters. He may not have contributed much, but he did draw the crowd’s attention and probably confused the hell out of Rain Or Shine. Both teams are known for their three-point-shooting prowess. It was only fitting then that the series was ultimately decided by a bunch of rainbow connections. It was historic in its own way—it marked the first time in PBA Finals history that a Game 7 had two extra periods. Back-to-back triples from Chism sandwiching a free throw split by Johnson knotted the contest at 97 apiece at the end of regulation. A stepback three by Johnson with just over a minute remaining in the first extra period helped Talk 'N Text keep in pace with Rain Or Shine, before Lee missed a potential game-clinching three. In the second OT, Ranidel de Ocampo nailed two threes to break the backs of the Elasto Painters. Lee hit a corner three to bring them back within one, but Larry Fonacier iced the game with a couple of free throws before fouling Lee to prevent ROS from attempting again from beyond the arc with three seconds to go.